One of the biggest questions people have who are preparing themselves for a divorce or who see one coming on the horizon is what should they do or not do to plan in advance. The answer obviously depends on your personal situation, but there are some guidelines everyone should follow to help them prepare. Do not be hostile with your ex if you have a child – One of the biggest things a judge will look at when determining any custody matter—and a factor written into custody laws—is which parent is most likely to encourage the child having a meaningful relationship with the other parent. You don’t have to bend over backwards for him or her, but you should avoid hostility or being the one to make things difficult. Remember things like emails and text messages are evidence as well, so make sure you’re not writing anything you wouldn’t want the judge to see. Try to stay in the marital home if you can – Remember that the kids will almost surely remain in the marital home in order to cause the least amount of disruption in their lives. The parent who remains in the home after the other has voluntarily moved out, is already at an advantage when temporary living arrangements are determined by the court. If you can, try to avoid being the parent that moves his or her stuff out of the house. Obviously, this does not apply to domestic violence situations, when you should get yourself to a safe place as soon as possible. If possible, save some money – You can ask a court to award temporary child support and alimony to help you out once the divorce is filed, but there could be a few weeks, or even a few months, between filing of the divorce and a hearing. If at all possible, try to have a financial cushion to get yourself and your kids by during this period. Change your passwords – If you have individual accounts that have shared passwords–your email account, for example–change these so that they are secure. You should not alter passwords to things that are owned by both of you, such as joint bank accounts, for example. Don’t raid the bank accounts – Speaking of bank accounts, don’t be the spouse that withdraws family money and leaves the other spouse penniless, or who sells the other spouse’s property for money. Stay off social media – Or at least, be aware that whatever you post on social media is evidence in court. Copy important records – Try to make and keep copies of any records or important documents that you may need, in case you do have to move out. 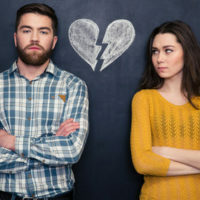 If you are getting divorced and have questions about what to expect, contact the Tampa family law attorneys at the Pawlowski//Mastrilli Law Group for guidance and planning information.